Was born in 1827, and educated at Eton. Lord De Ros is a keen and expert yachtsman, and has for many years taken a practical interest in yachting connected with the coast of Ireland. He has taken part in regattas at Lough Strangford, Lough Erne, and he has also raced on board the Zara and Egeria at Cowes and the Thames. Red Rose, Cutter, 6 tons. Lord de Ros. He com­menced his experience as a boy, then owning the 4-ton cutter the Fairy, and subsequently built the Red Rose (6 tons) and inherited Mabel yawl (19 tons), both of which he owns at the present time. He also owns the original Una boat, which was brought from America by the Marquis of Conyngham in 1853, and was presented to Lord De Ros in 1873. She created a considerable sensation on her first appearance, but proved to be fast and weatherly in smooth water. She is a centre­board boat with a single gaff sail, the mast being stepped close to the bows, the entrance being very fine, and the quarters full. The type has been extensively adopted in England for sheltered waters, but it is totally unsuited for the sea. 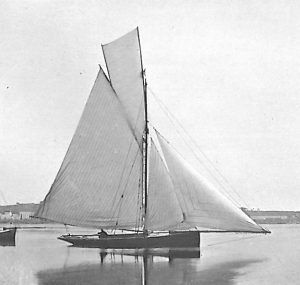 In September, 1869, he sailed in a race on Lough Erne in the Zephyr, 15 tons, when the crew consisted of Colonel Crichton, Colonel Fitzroy Clayton, and himself, with two lads, when she carried away her bowsprit in a squall; those on board cleared away the wreckage, and, rigging up a jury bowsprit, won the race. This feat testifies to the sterling seamanship of the amateur crew, and proves that the early training of Lord de Ros was that of no ‘kid-gloved’ sailor. Address: Old Court, Strangford, co. Down.